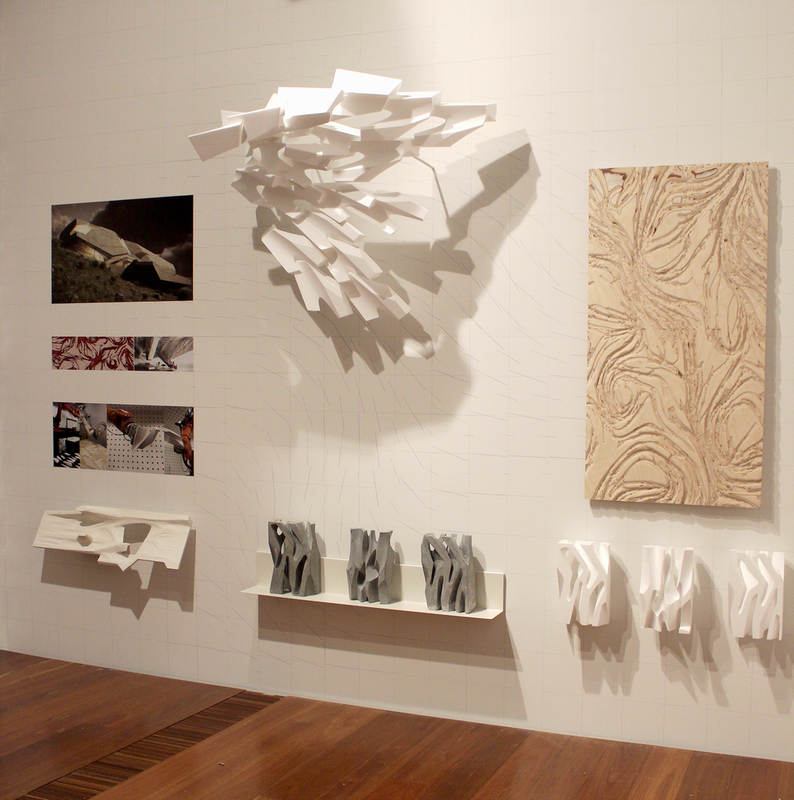 A few photos of our Composite Wing project being installed at RMIT Design Hub. Thanks to Erik North, Tim McLeod and the installation team for a fantastic job fitting the parts together. The surface for the wings were laminated by Composite Constructions, who specialise in composite fibre boat building. The 65m2 surface is only 3mm thick, fabricated in 8 parts. Inlaid within the Composite Wing project by Studio Roland Snooks are a network of beams that are designed through a multi-agent algorithm and fabricated from foam and silicon. These beams are described as agentBodies, and provide the necessary structural depth for the 3mm thick fibreglass to be self-supporting. There are two scales of bodies in the project, large foam bodies which are milled and small silicon bodies that are robotically extruded. The double curvature parts of the bodies are milled using a Kuka KR60HA robot. The flat parts of the bodies are milled using a 3 axis mill. The foam bodies are painted and hand finished before being setout ready for laminating into the fibreglass surface. Thanks to RMIT Architecture and Design Workshops (Andrew Thompson, Kevin O'Connor, Rafael Diem, Daniel Ong, Ron Ellazam) and the RMIT students who worked on the fabrication: Wen Yap, Farah Rozhan, Milou van Min, Franco Zagato, Simone Tchonova, Jesse Thomas, Emily Cipriani, Scohldun Beaver, Yee Shuian Sang, Say Huang Tan, Sebastian Nicht, Jack Mansfield-Hung, Chris Ferris, Tim Cameron, Kei Jin Pook, Yuxi Cheng, Jonathan Kim, Fahimeh Mosavari, Rebecca McGlade, Edmund Olowo, Vincent Lai, Sanghan Gang, Yuxi Cheng, Stephen Annett, Tuyen Tran, Pat Anglin, Matt Ellis. The fibreglass surface of the Composite Wing project is being laminated on a timber mould. Here are few photos of the mould being fabricated - part robotic milling, part nail gun. Five different fibreglass parts are being laminated from the same mould which is 6m x 5.5m x 2.8m. The mould became a little architectural project in itself. The composite fibre project will be installed at the RMIT Design Hub as part of exhibition design for, 'The Future Is Here', opening August 28th. Parts of the timber mould was robotically milled from laminated 19mm sheets of MDF. This is one of 5 parts that make up the central double curvature part of the mould. Milled at RMIT. The ArchiLab Naturalising Architecture exhibition closed last night at the FRAC in Orleans, however our National Art Museum of China (NAMOC) and Babiy Yar models are joining the FRAC's permanent collection. Here are few photos of the NAMOC model. NAMOC is a collaboration with Robert Stuart-Smith. More on the project can be found here. With the ArchiLab exhibition Naturalizing Architecture closing next week, we are posting a few images to explain the fabrication of one of our models in the exhibition - Babiy Yar Memorial. The model is built in three parts. The base is milled with a Kuka robot and finished with automotive paint. The shell of the museum is 3D printed in plaster. The atrium is 3D printed in resin. Roland Snooks will discuss the studio's work in the Melbourne Now exhibition at the National Gallery of Victoria (NGV) on January 31, as part of the gallery talks series. The exhibition includes a series of prototypes from active projects in the studio that engage robotic fabrication techniques. The presentation will be held at 12:30pm on the level 2 gallery at NGV Federation Square in Melbourne. Studio Roland Snooks is exhibiting a series of projects at the Melbourne Now exhibition at the National Gallery of Victoria [NGV]. Studio Roland Snooks is one of 6 Melbourne architecture practices to exhibit in the 'Incubator Room', showcasing architectural processes and prototypes. Roland Snooks will moderate a panel discussion at the New Normal symposium at the University of Pennsylvania today. The symposium organised by Roland Snooks, Winka Dubbeldam and Ferda Kolatan brings together an array of architects and theorists working in experimental forms of practice, including: Francois Roche, Jason Payne, Mark Goulthorpe, Neil Denari, Ben van Berkel and Manuel DeLanda. Experimental projects by Roland Snooks have been published in "Architecture InFormation". The book include essays by: Mario Carpo, Patrik Schumacher, Bernard Cache, Evan Douglis, Antoine Picon, and Achim Menges. In addition to projects by: Diller Scofidio and Renfro; Alejandro Zaera-Polo; Philippe Rahm; Eisenman Architects; Preston Scott Cohen; Eiroa Architects; Michael Hansmeyer; Nader Tehrani, Office dA; Thom Mayne, Morphosis; Reiser and Umemoto; Philip Beesley and Francois Roche.